I’m one of 10 chosen to take part in the newly established digital board certification course: DISP. Together with nine other tech talents from companies such as Klarna, Google, Amazon and Tieto – I will engage in board work to increase digital competence in boards. 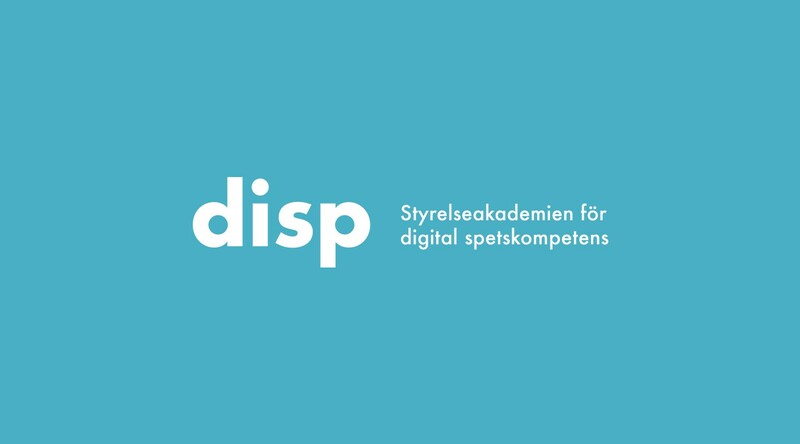 DISP is the first and only board course in Sweden for people with digital expertise and tech talents, who understand the importance of digital transformation and want to help Swedish corporates adapt and take lead. 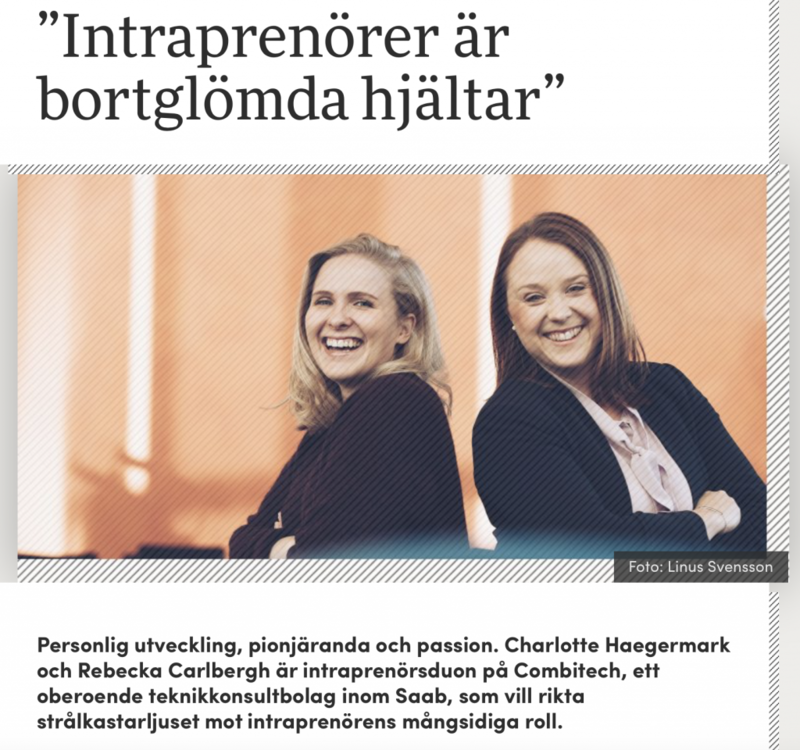 Together with my colleague Rebecka, talking about intrapreneurship in the career magazine Shortcut. Headline: ”Intrapreneurs are forgotten heroes”. Proud nominee of the ”Intrapreneur of the Year” award 2017, arranged by recruitment agency Talentia. The award is given to an intrapreneur who has ”demonstrated an extraordinary ability to discover possibilities and realize ideas as well as organize and create resources to achieve outstanding results”. American business magazine Forbes award Europe’s brightest rising stars, groundbreaking innovators and leaders of tomorrow. 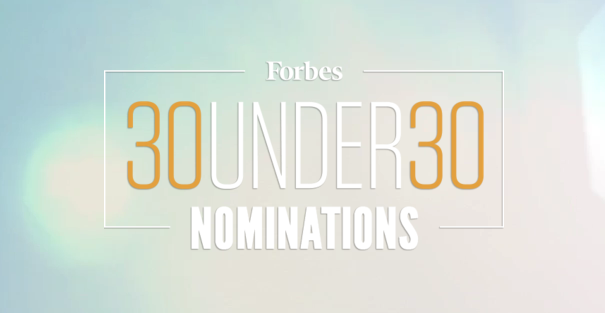 I was honored to be recognized as a candidate for the Forbes Magazine 30 under 30 list 2017. Initiative from the Saab Group HR department in order to highlight inspiring colleagues at Saab and Combitech (part of Saab Group). Nominations from the whole company were accepted and Top 5 (out of 15.000 employees) were later determined by letting all employees vote on their favourite nomination. The East Sweden Marketing Association has awarded the most promising marketing professionals in the East Sweden region. I was honored to receive the Rising Star Award 2016. ”She has in a short period of time through dedication, strategic work and creativity developed ideas and concepts – challenging conventional marketing. Together with her team at Combitech, she managed to reach the target group in new ways, lifting the organization to a whole new level. A bright future lies ahead. The Swedish Association of Communication Professionals has rewarded great communication since 1991. The award is given to individuals and organizations who have performed outstanding communication achievements the past year. 2016 I managed to reach Top 3 in the category ”Young Talent 2016”. I guess you already figured out my biggest passion in life is cars and motorsport. I started racing karts when I was 10 years old and just got hooked. In 2008 I decided to realize my dream. During two years I was a karting driver in the German Championship, representing Sweden in the Swedish National Karting Team. It was during this time I found my passion for communication and how to use it in order to develop my team, my brand and people around me. Today I use my passion to engage in innovation & intrapreneurship – being an intrapreneur myself, but also having a mission to raise awareness about intrapreneurship as a powerful innovation tool. Finding gaps and going for them. Give it your all, with what you’ve got today. Standing up for yourself, although you’re a minority and some wants you to fail. Tactics. Races aren’t won in the first curve. Taking part in the launch campaign for the new Volvo XC60 for Volvo Cars USA. I want to empower women when it comes to car confidence. More women should feel confident enough to buy their own cars and feel empowered as drivers. In order to be a female role model, I take part in car commercials. I want to set an example that women are just as natural as drivers and car owners. Feel free to contact me if you want to join me in my mission. A few projects I’d like to show you. Enjoy! What do my previous employers and colleagues say about me? Click on the images to have a look. She contributes incredibly much to our team and the company in general – both in terms of professional knowledge, a service-oriented way of working and her warm personality. has the ability to identify how we should evolve in order to face the challenges of today and tomorrow.